It's as easy as 1, 2, 3 to gift great with Shorty's Liquor this year! If you want to send an amazing gift to your colleagues, clients or just dear friends that will have your recipient lunging for the phone to call and thank you, but are worried you might send something completely inappropriate or forgettable instead, then Shorty’s can help. We understand that choosing the right corporate gifts for your clients, staff, business partners or even your loved ones can be a stressful experience. This is especially true during the hectic holiday season, or if the gift is for an important anniversary or event. The team at Shorty’s Liquor has over sixty collective years of experience in thinking about just these kinds of questions, so it’s a good bet we have the answers you’re looking for. After recommending corporate gifts to thousands of Shorty’s customers, and hearing direct feedback on how each gift was received, we have the delicate art of corporate gifting almost down to a science. Click here to to view the Wattle & Jones gifting collection or browse our gifting ideas on the website. Call us for a confidential chat on 1300 SHORTY (746 789). We can recommend a successful gift for your recipient even if you don’t know very much about them, and make sure it is delivered at the time you choose to nearly any address Australia wide. 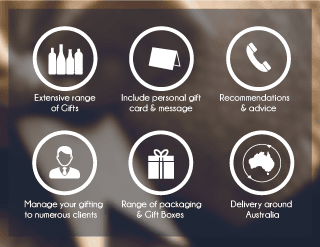 Shorty's Liquor can organise the gift cards, package and arrange the delivery Australia wide. Even if you have lengthy list of different gift recipients at different addresses, with each gift needing a personal card, we've got you covered. For single gift deliveries you can specify the gift, address and card message when you are checking out at our website - check out some of our gift packaging options here. Please download this Gift Order Form or provide the data in a similar format, emailed to orders@shortysliquor.com.au. We will send you tracking throughout the entire delivery process so you know when the gifts have been received.